The hunt has been on going to find the fluffiest American pancakes out there. After many weekends, usually Sunday mornings, of trial and error, making stacks upon stacks of fat pancakes of varying success, I can finally put down the recipes books. I have found the recipe for the lightest, fluffiest most joyful pancakes out there. Sieve the flour and baking power into a large mixing bowl, add the sugar and set aside. Put your butter into a small cup and pop it in the microwave for 20seconds. In a measuring jug, add the milk & whisk in your egg, this is what will give you lots of lovely air bubbles. Once the butter has cooled slightly, but is still melted, whisk that in with the milk and egg. Pour the contents of the measuring jug into your mixing bowl, and using a wooden spoon, fold the mixture together until there are no lumps and you have a thick batter. Heat a knob of butter in a large, non stick frying pan. When the butter has melted and you have a good heat, spoon the batter into the pan, the batter will spread out, so don’t put them too close together. Wait until you see bubbles forming on the top of the pancakes and flip. Cook for another minute or so on the other side. Keep an eye on the temperature, turning it down slightly half way through, you don’t want first side of the pancakes to burn. 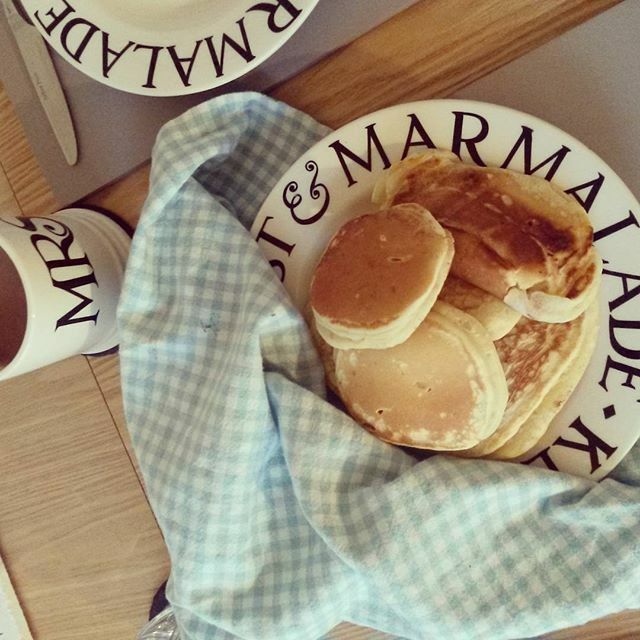 Stack your pancakes on a plate, covering them with a tea towel until you are ready to serve.